The Komondor is one of two Hungarian livestock guardians, the other being the Kuvasz. Livestock guardians do not herd their charges, but instead protect them. Komodorok traditionally guarded both sheep and cattle, living with their charges and fending off predators that included bears and wolves. Young dogs are reared with their livestock to create an attachment that will cause them to give their own lives if necessary. Their unique, corded coat helps protect them during attacks and can take up to two years to form and five years to reach the desired length for showing. Hungarian legend says that in the 10th century shepherds found a litter of wolf cubs and after selecting those that behaved most like dogs crossed them with native breeds to produce the Komondor. There is no proof to this tale and the exact ancestry of this ancient breed remains unknown. The earliest written record traces back to 1544 in a Hungarian codex, but gives no hint to its origin. Most sources state that they are descended from Ovcharkas (or Tibetan dogs, such as the Tibetan Mastiff) brought to Hungary by the nomadic Magyars over 1,000 years ago. More recently it has been suggested that they may have accompanied the Cumans, a Turkish speaking nomadic tribe who settled in Hungary during the 12th and 13th centuries. Komondor-type remains have been found at Cuman grave sites and it may be that the name of the breed itself is derived from Koman-dor or “dog of the Cumans”. Perhaps the simple answer is the Komondor was the preferred dog kept by the Cumans, while a second Hungarian breed, the Kuvasz, was chosen by the Maygars. Today the Komondor can still be found in Hungary’s rural areas and is now considered a National Treasure, preserved and protected from modification. 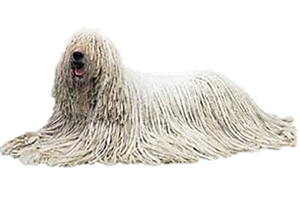 Is the Komondor Right for You?